When shopping for a mortgage, time is essential. You want to get the best rate and loan program possible, but you’re also under a deadline to remove your loan contingencies and get your financing in order. Quicken Loans might be the most well known online mortgage lender. You see their commercial on TV, and their advertising in most major finance publications. So, how does Quicken Loans stack up when it comes to getting a mortgage? Well, I recently went through the process of getting a home loan with them, and I thought they were excellent. Here’s my review of Quicken Loans, why I went with them, and my experience using them. Remember, I am a strong believer of shopping around for a mortgage. Don’t just consider Quicken Loans. Look at using LendingTree to quickly compare different lenders to get the best rate and terms possible for your situation. I initially tried Quicken Loans because I was looking to get a mortgage pre-approval letter to submit with my offer. In a competitive housing market, it is essential that you provide a pre-approval letter with your offer to improve the quality of your offer for your seller. It shows that you have a strong ability to get a mortgage. However (sadly), many places make it difficult to get a pre-approval letter. For example, when we reviewed SoFi Mortgage, they would offer a pre-qualified letter, but not a pre-approval letter. The difference is in their underwriting process. Even worse, many traditional banks and credit unions will take days to provide a pre-approval letter, and that won’t work for people in highly competitive markets. That’s why we recommend online mortgage lenders for anyone looking for a mortgage. Quicken Loans was able to provide a pre-approval letter quickly, and deliver it online so we could submit our offer the same day. It was great to be able to get this online. I wasn’t originally planning on actually getting a loan with them, but they had good programs with good rates, so we continued the process with them. Quicken Loans has a program called Rocket Mortgage, which is the main platform they use for online mortgage applications. The platform is pretty awesome - you can enter your information quickly and easily, and their tool actually allows you to connect your bank or brokerage to automatically import your account information. This saves you time if it works. One challenge I encountered was that their system did not like my self-employment income. As a result, it got hung up. I was a little frustrated for a minute, but in my email I had a loan officer assigned and I gave him a call right away. My loan officer Dan was fantastic. He was able to sort out all my information, run me through loan programs, validate that my self employment income would qualify by looping in an underwriter, and get me a pre-approval letter in minutes. I would say start-to-finish, it took about 30 minutes to get my information input and pre-approval letter issued. This high level of service encouraged me to continue to use their platform for my loan. Fast forward about a week, and our offer was accepted. Now it was time to do the “real work” of getting a loan. Being a good financial expert, I made it a point to shop around for a loan, and used LendingTree as well as looked at a local credit union. The only problem was the loan contingency removal period. Given the hot housing market, to make our offer competitive, we said we could do a 10 day contingency removal period, which would cut things close. Remember, you have to schedule an appraisal, and then have the loan company’s underwriters approve everything. Factor in weekends, and that’s tight. However, Quicken Loans came through again. After spending a day shopping around, I called Dan back up and told him our offer was accepted. He was great about getting the process moving FAST. I was shocked. He told me, if I did my part and got all my documents uploaded, he would do his part and ensure that we met our deadlines. I hustled that afternoon and got all my documents uploaded into their online system (which was really easy), and Dan got the appraisal ordered. You want to talk about fast - Quicken Loans was able to get an appraisal ordered AND executed in less than 24 hours. It was ordered at roughly 5pm on a Monday, and the appraisal was done at Noon the next day. That was impressive. The rest of the process was very smooth, with their online system and consistent phone calls ensuring that the process went well. Getting a loan is never easy, but Quicken made it as easy as possible. I really only encountered two real problems. First, their Rocket Mortgage system didn’t play nice with my information at the beginning. Maybe it was my self employment income or something I entered, but it basically stalled out and couldn’t give me an answer for my mortgage. However, my loan officer Dan was quickly able to course correct this with a phone call and get everything squared away. Second, Quicken Loans doesn’t have many loan programs available. They keep it very simple, with the basic 15 or 30 year fixed rate, and a 5/1 ARM. They may have other “secret” programs, but this was all I saw on their site and all that was offered when I spoke to my loan officer. It’s not a huge drawback, but having loan program options is always a plus. 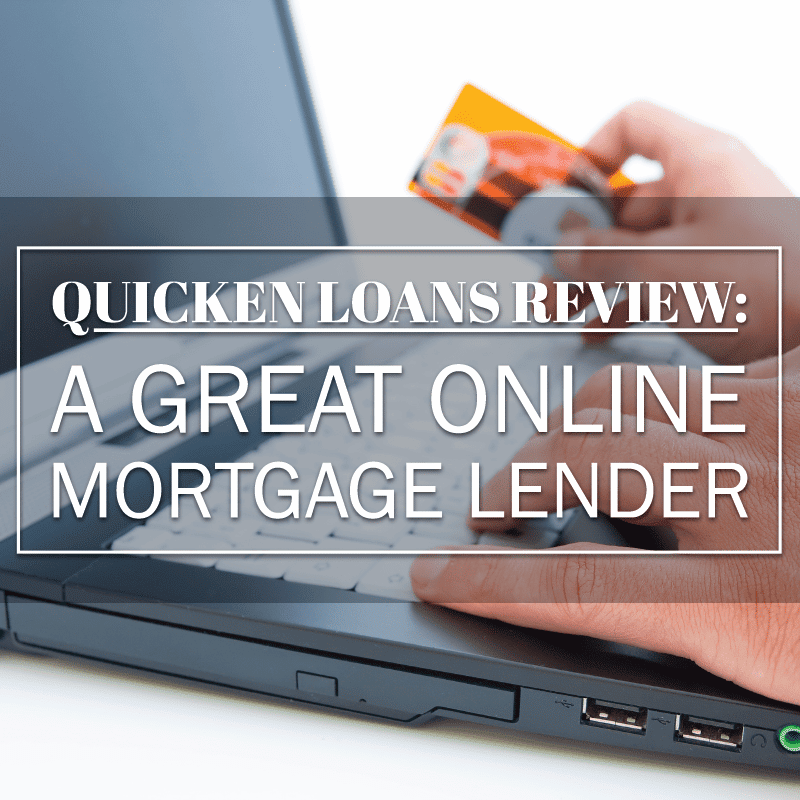 While I’m a huge believer in comparing online lenders (because your mortgage will likely be the biggest payment in your life and a small change can make a huge difference), Quicken Loans provided excellent service with a good mortgage program. I can’t say if every experience was like mine, but Dan (my loan officer) was great and their system for handling documents and communication is top notch. I recommend them and would use them again in the future. Would you ever try Quicken Loans? Why or why not? Quicken Loans is an online lender that has a great tool for quickly and easily applying for a mortgage called Rocket Mortgage. The process is simple, and their customer service is top notch. I just recently used them and was pleasantly surprised, too. Super fast, super easy, and professional. Highly recommend.